The law is more than just a profession for lead attorney Gregory Kirakosian; it's in his blood. Growing up in a family of California judges, public defenders, prosecutors and plaintiff laywers, Greg found his calling in the courtroom. He ahs a deep respect for the law and firmly believes that civility, credibility and integrity are some of the most important attributes for achieving positive outcomes. 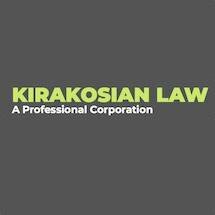 Prior to launching Kirakosian Law APC, Greg earned his stripes as a trial attorney by working several years in one of the nation's most successful criminal and civil litigation firms, GERAGOS & GERAGOS. Greg worked side by side with the world renowned trial lwayer Mark Geragos and handled numerous high-profile and complex cases. He also gained experience on the defense site of catastrophic personal injury cases and highway tort claims while working at Caltran's Legal Division, assisting its Chief Counsel with depositions and trial preparation. This provided Greg with a strong grasp of government immunities and understanding of what it takes to beat a government entity in court. Greg's success as an attorney also stems from paying close attention to detail and having an overwhelming understanding of the law to be able to find multiple angles in a case to outmaneuver the opposition. He's motivated to go above and beyond to win for his clients who have been wronged and injured by negligence or intentional conduct of others. Most importantly, Greg strives to shepherd his clients through the complex and confusing process by keeping them informed and empowered in their quest for justice. Besides his private practice, Greg has served on ACLU's Jails Project helping inmates receive proper medical and psychological care. He serves as the legal counsel for the Pasadena Armenian Genocide Memorial Committee for the development construction and maintenance of the PAGMC genocide memorial.